these days, and there is a good reason for it. The seamless appearance of frameless glass is appealing to both homeowners and potential buyers due to the fact that it makes smaller spaces appear far larger. Eliminating clunky mounting hardware provides an even sleeker look, especially in crowded areas. Technology in the shower industry is constantly evolving providing installers with new and innovative methods of securing glass to walls without the use of channels, massive headers, and unyielding clips. These days the use of sleeve over clamps and support bars are able to replace visible headers. As a result of eliminating the headers, the exposed glass edges may now be polished, providing an even smoother, sculpted appearance. In addition, removing the header from the equation also does away with the appearance that the room is divided by the shower. This creates a far more open and flowing floor plan, which is always a plus no matter how many square feet the bathroom is comprised of. 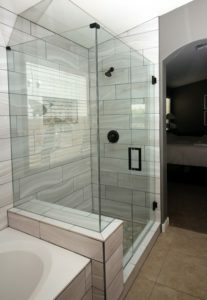 Homeowners that choose frameless glass showers with minimal hardware have far more freedom regarding both the design and decoration of their bathroom. Since the glass is custom designed and manufactured in essence the enclosure is able to fit into any existing space. The same certainly cannot be said of the pre-manufactured framed versions that are only made to fit specific spaces. Most frameless shower enclosures are manufactured from either 3/8-inch thick or ½-inch thick tempered glass. The 3/8-inch thick is less expensive, and to most eyes appears the same. That being said, it is vastly important to check with your installer regarding this matter. In some installations, the ½-inch thick tempered glass is required in order to provide superior support for long glass walls, and pivot doors. A cost effective method is to install the 3/8-inch glass in combination with the ½-inch glass in the required areas. When installed correctly it is virtually undetectable and can save the homeowner money. Glass happens to be highly resistant to mold and mildew which can become a tremendous problem for showers made of other materials such as tile and wallboard/plaster. 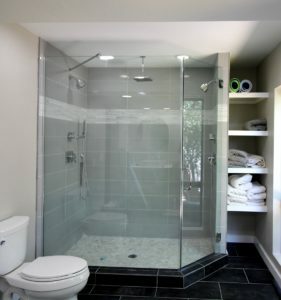 In addition, frameless glass shower enclosures are extremely easy to clean. All it takes is a weekly spray with some basic glass cleaner to keep the enclosure sparkly clean. A Cut Above Glass is the leading designer and installer of frameless glass shower enclosures in Scottsdale, Arizona and surrounding areas. Please contact us today for an initial consultation regarding minimal hardware shower glass, and any other of your glass related needs.